Bernie and George have been best friends since the third grade. 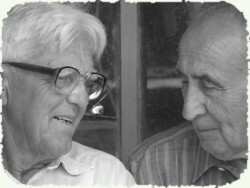 For over seven decades they’ve been there for each other. High school, the war, weddings, kids — they helped each other through everything that life could throw at them. Sunday afternoon dinner with the wives has been a tradition since the week after George’s honeymoon. This week they are at Bernie’s house. The ladies are in the kitchen for tea and gossip while the boys relax in the living room. “Took the little woman to a wonderful new Italian place on Thursday,” said Bernie. “Great. What’s the name of the place?” asked George.